For his father, see Ernő Rubik (aircraft designer). The native form of this personal name is Rubik Ernő. This article uses Western name order when mentioning individuals. 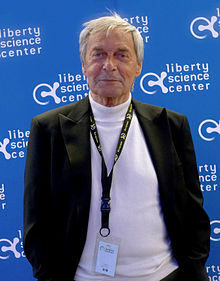 Ernő Rubik (Hungarian: [ˈrubik ˈɛrnøː]; born 13 July 1944) is a Hungarian inventor, architect and professor of architecture. He is best known for the invention of mechanical puzzles including Rubik's Cube (1974), Rubik's Magic, Rubik's Magic: Master Edition, and Rubik's Snake. While Rubik became famous for inventing the Rubik's Cube and his other puzzles, much of his recent work involves the promotion of science in education. Rubik is involved with several organizations such as Beyond Rubik's Cube, the Rubik Learning Initiative and the Judit Polgar Foundation all of whose aim is to engage students in science, mathematics, and problem solving at a young age. Ernő Rubik was born in Budapest, Hungary, 13 July 1944, during World War II, and has lived all his life in Hungary. His father, Ernő Rubik Sr., was a flight engineer at the Esztergom aircraft factory, and his mother, Magdolna Szántó, was a poet. He has stated in almost every interview that he got his inspiration from his father. Beside him I learned a lot about work in the sense of a value-creating process which has a target, and a positive result too. Both figuratively and literally he was a person capable of 'moving a hill'. There was nothing that could prevent him from doing what he decided or bringing a project to a completion, if necessary even with his own hands. No work was unworthy or undeserving for him. From 1958 to 1962, Rubik specialised in sculpture at the Secondary School of Fine and Applied Arts. From 1962 to 1967, Rubik attended the Budapest University of Technology where he became a member of the Architecture Faculty. From 1967 to 1971, Rubik attended the Hungarian Academy of Applied Arts and was on the Faculty of Interior Architecture and Design. Rubik considers university and the education it afforded him as the decisive event which shaped his life. Rubik has stated that "Schools offered me the opportunity to acquire knowledge of subjects or rather crafts that need a lot of practice, persistence and diligence with the direction of a mentor." From 1971 to 1979, Rubik was a professor of architecture at the Budapest College of Applied Arts (Iparművészeti Főiskola). It was during his time there that he built designs for a three-dimensional puzzle and completed the first working prototype of the Rubik's Cube in 1974, applying for a patent on the puzzle in 1975. In an interview with CNN, Rubik stated that he was "searching to find a good task for my students." Rubik showed his prototype to his class and his students liked it very much. Rubik realized that, because of the cube's simple structure, it could be manufactured relatively easily and might have appeal to a larger audience. Rubik's father possessed several patents, so Rubik was familiar with the process and applied for a patent for his invention. Rubik then set out to find a manufacturer in Hungary, but had great difficulty due to the rigid planned economy of Hungary at the time. Eventually, Rubik was able to find a small company that worked with plastic and made chess pieces. The cube was originally known in Hungary as the 'Magic Cube'. Rubik licensed the Magic Cube to Ideal Toys, a US company in 1979. Ideal rebranded The Magic Cube to the Rubik's Cube before its introduction to an international audience in 1980. The process from early prototype to significant mass production of the Cube had taken over six years. The Rubik's Cube would go on to become an instant success worldwide, winning several Toy of the Year awards, and becoming a staple of 1980's popular culture. To date, over 350 million Rubik's Cubes have been sold, making it one of the best selling toys of all time. In addition to Rubik's Cube, Rubik is also the inventor of Rubik's Magic, Rubik's Snake and Rubik's 360 among others. In the early 1980s, he became the editor of a game and puzzle journal called ..És játék (...And games), then became self-employed in 1983, founding the Rubik Stúdió, where he designed furniture and games. In 1987 he became a professor with full tenure; in 1990 he became the president of the Hungarian Engineering Academy (Magyar Mérnöki Akadémia). At the Academy, he created the International Rubik Foundation to support especially talented young engineers and industrial designers. In 2009, he was appointed as an honorary professor of Keimyung University, Daegu, South Korea. In the 2010s, Rubik has recently spent much of his time working on Beyond Rubik's Cube, a Science, Technology, Engineering, Mathematics (STEM fields) based exhibition, which will travel the globe over the next six years. The grand opening of the exhibit was held on 26 April 2014 at the Liberty Science Center in New Jersey. At the exhibition, Rubik gave several lectures, tours, and engaged with the public and several members of the speedcubing crowd in attendance, including Anthony Michael Brooks, a world-class speedcuber. Ernő Rubik has listed several individuals who, as he has said, "exerted a great influence over me through their work." These include Leonardo da Vinci, whom Rubik regards as the Renaissance man; Michelangelo, whom he respects as a polymath, painter, and sculptor; and artist M.C. Escher, who drew impossible constructions and grappled with explorations of infinity. As regards to philosophers and writers, Rubik admires Voltaire, Stendhal, Thomas Mann, Jean-Paul Sartre, Hungarian poet Attila József, Jules Verne, and Isaac Asimov. In the field of architecture, Rubik is an admirer of Frank Lloyd Wright and Le Corbusier. Rubik admits to being a lifelong bibliophile and has stated, "Books offered me the possibility of gaining knowledge of the World, Nature and People." Rubik has stated that he has a special interest in science fiction. Rubik is fond of outdoor activities such as walking through nature, playing sports, and sailing on Lake Balaton. Rubik is also an avid gardener and has stated that, "collecting succulents is my favourite pastime." Editor and co-author of A bűvös kocka ("The Magic Cube"), Műszaki Kiadó, Budapest, 1981. Co-author of The Rubik's Cube Compendium (written by David Singmaster, Ernő Rubik, Gerzson Kéri, György Marx, Tamás Varga and Tamás Vekerdy), Oxford University Press, 1987. He attended the 2007 World Championship in Budapest. He also gave a lecture and autograph session at the "Bridges-Pecs" conference ("Bridges between Mathematics and the Arts") in July 2010. Rubik is a member of the USA Science and Engineering Festival's Advisory Board. ^ William Fotheringham (2007). Fotheringham's Sporting Pastimes. Anova Books. p. 50. ISBN 1-86105-953-1. ^ International Who's Who 2000. Europa. 1999. p. 1342. ISBN 1-85743-050-6. ^ a b c The little cube that changed the world Retrieved 2013-04-29. ^ "Rubik's Cube 25 years on: crazy toys, crazy times", Independent, 15 August 2007. ^ "Cube Exhibition May Come to Korea". The Korea Times. 2009-09-24. ^ John Nadler, "Squaring Up to the Rubik's Cube", Time, 9 October 2007. ^ US Science and Engineering Festival Advisors Archived 21 April 2010 at the Wayback Machine Retrieved 2010-07-05.